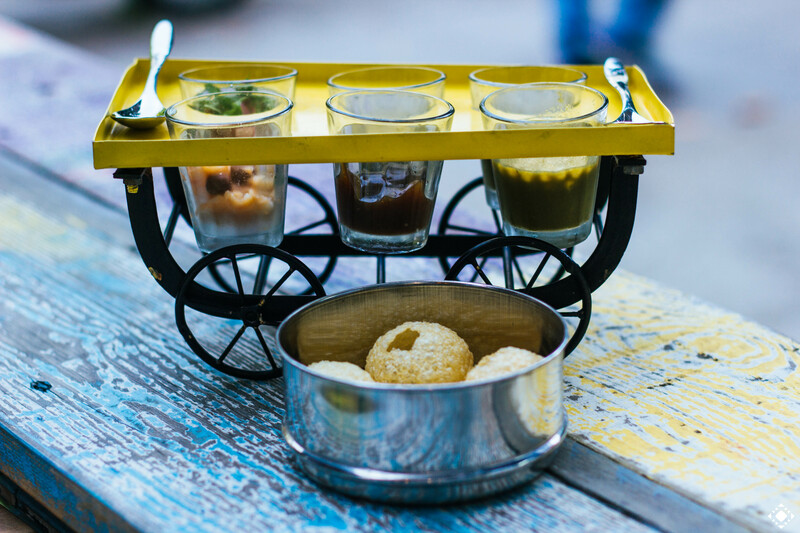 Chai Naasto is an Indian street food restaurant founded by three brothers who wanted to share their grandmother’s recipes. 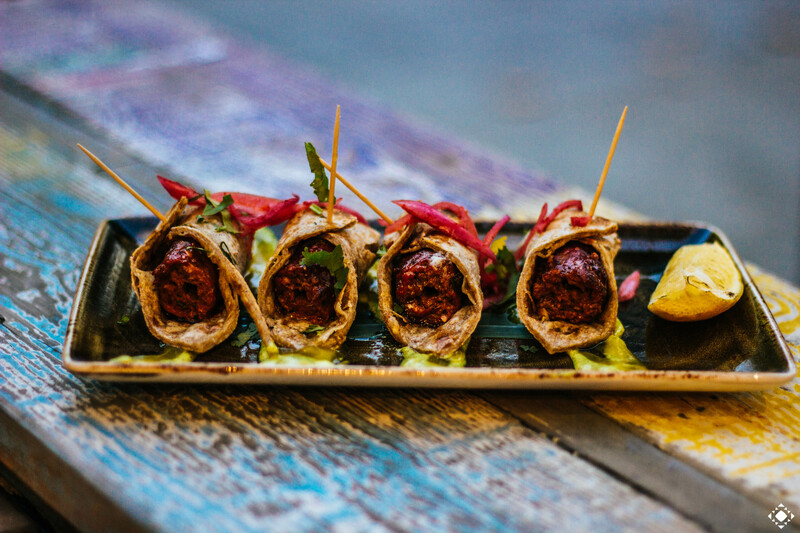 As has been the trend in the Indian food scene in London, Chai Naasto focuses on small plates / tapas style dishes and their Hammersmith restaurant is located in a residential area around ten minutes from the station. We arrived at Chai Naasto on a Wednesday evening and ended up having a meal that lasted over two hours. You’ll see why when you read more about what we ordered! We were greeted by a waiter who pointed us to one of the booths inside the restaurant. The booths had been designed to resemble carriages on Indian trains and each had the name of a different Indian state. Knowing that we would need good lighting for pictures, we asked to relocate to a table outdoors. Although they did have covered outdoor seating (with heating!) we chose to sit opposite it mostly because of the ease of taking photos. The waiter was very helpful in talking us through the extensive menu and he explained how the dishes represent a journey through India. He pointed out his favourites (most of which we ended up ordering) and insisted we try some of them in addition to the dishes we had already ordered. 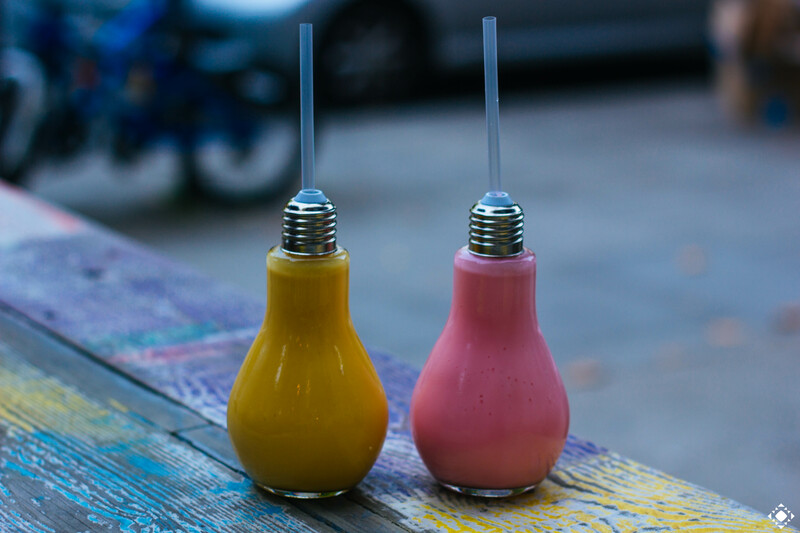 We started off with drinks – a Mango Lassi and Rose & Cardamom Lassi served in Instagram-friendly light bulb drinking glasses. The Mango Lassi was the clear favourite out of the two. I felt the flavour in the Rose & Cardamom Lassi was too strong and the taste didn’t complement the flavours of my meal. On its own it would have fared better but drinking it alongside masala dishes didn’t suit my palate. 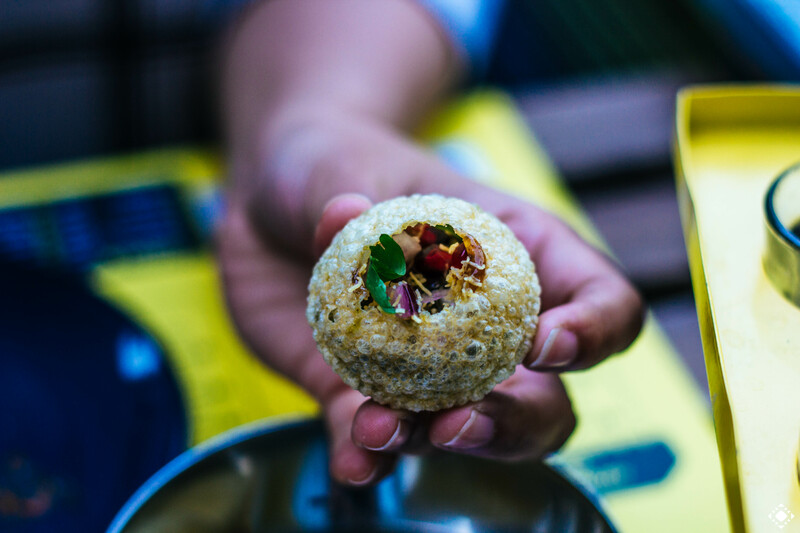 The first dish that came out was the Bombay Bhel Puri – a classic Mumbai street food. We were fascinated by the puri itself which, if you take a look at the second image, was a lot stronger than the usual puris you get at Indian restaurants. Ordinarily, puris get soggy once you put in the tamarind water and chutneys and we were glad that these were different. The puris were crispy and we filled them with diced potatoes, diced onions, chickpeas, sev, pomegranate seeds, tamarind and a touch of coriander. Next up were the Bombay Chilli Cheese Bites. These were chilli cheese nuggets crumbed, fried and then drizzled with a chilli sauce. From the moment they came out we could see the steam coming out of the pot and when we opened them the cheese oozed out. This was a great dish but I do wish they were crispier on the outside (as stated on the menu). It’s possible that they lost their crispiness because they were served on top of one another and the steam from each chilli cheese bite caused it to become slightly soggy. With that said we’d still recommend them as a cheeky indulgence. One of the highlights of the evening for me was the Chandni Chowk Ke Samose Chaat. This dish was made up of crispy Punjabi vegetable samosas broken and served with spiced chickpeas. This was then drizzled with a melody of chutneys and topped with diced onions and pomegranate seeds. As expected with a samosa chaat, this was served warm and the textures and flavours in this dish worked so well together. The samosa had maintained its crispiness and the chutneys stopped it from being dry. I had to stop myself from finishing it all given the number of dishes that were yet to come. Next up was the Chandni Chowk Crispy Kale Chaat. 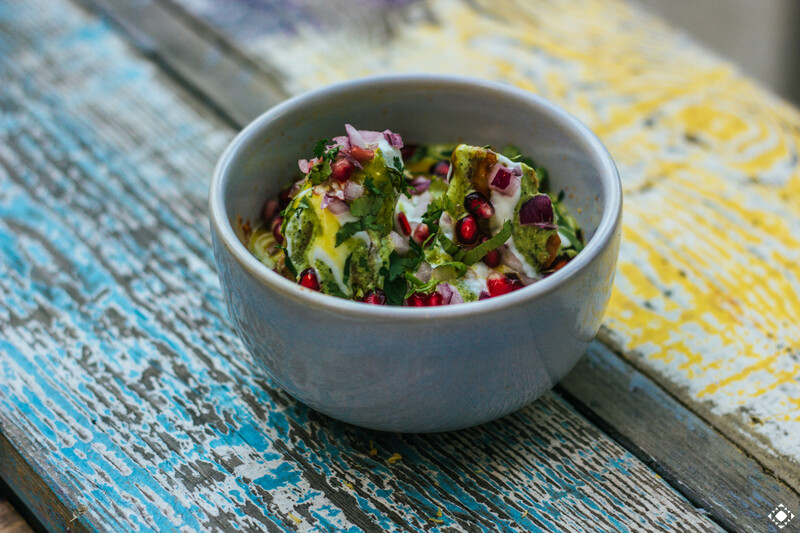 The last time I had a kale chaat was at Talli Joe and so their version was the only one I could compare Chai Naasto’s version to. 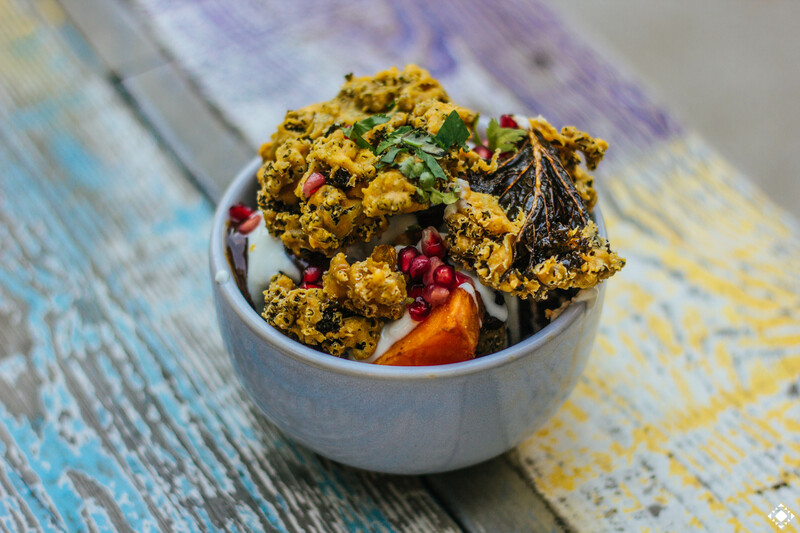 The kale was served in a bowl with roasted sweet potato, pomegranate seeds and similar chutneys as had been present in the samosa chaat. The kale was crispy, the potato soft and the whole dish was a melting pot of flavours that we would happily indulge in again. Both Zohra’s and my own favourite dish of the night has to be the Kekda Koliwada. 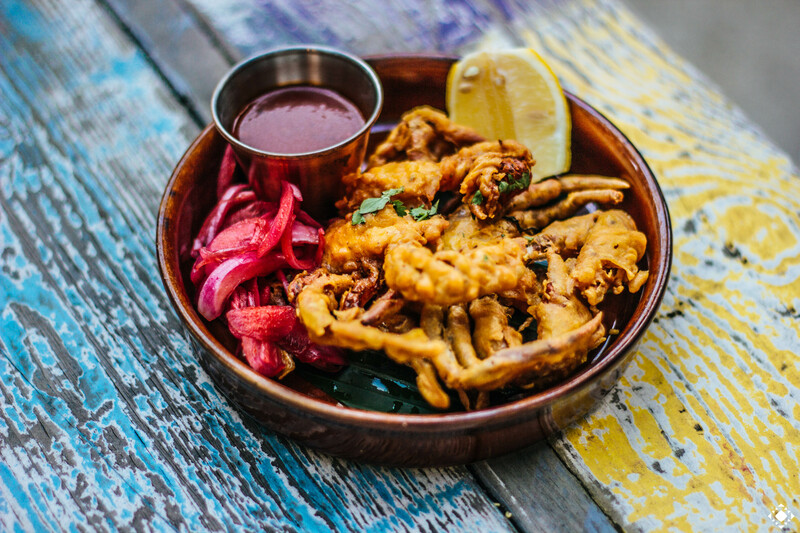 On the plate was soft-shell crab marinated with spices, battered, fried and served with a smoked tomato chutney. The batter was crispy and the crab itself was delightfully soft. We felt that Chai Naasto had got the batter to crab ratio just right meaning the batter didn’t overpower the crab. 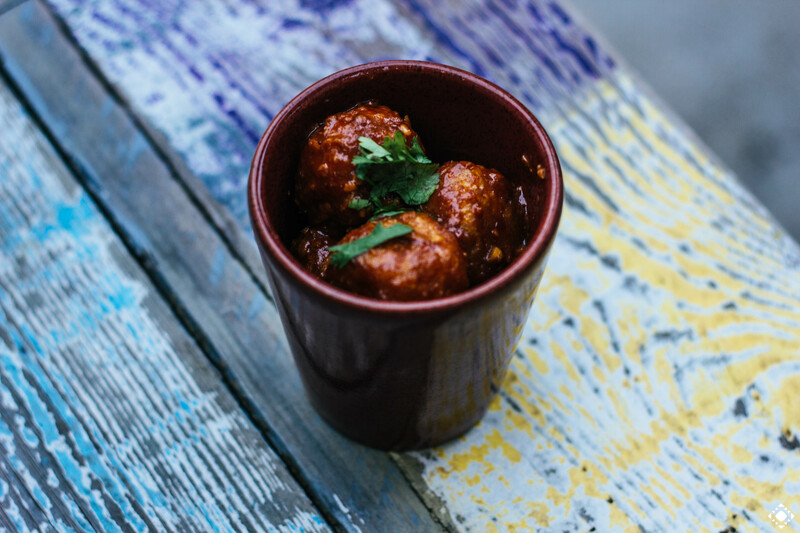 Paired with the smoked tomato chutney and a squeeze of lemon on top, the dish is one we have no hesitations in recommending. Done with the chaats, we moved on to the grills. First up was Khan Chacha’s Seekh Paratha – lamb seekh kebab served rolled inside a paratha with mint chutney and pickled red onion. The kebab was juicy, flavoursome and enjoyed both with and without the paratha. Admittedly I had to ditch the paratha on my second kebab because I was running out of space. At this point it should be highlighted how perfect the timing of the waiters was in bringing out our dishes. We had enough of a break between dishes to be able to enjoy them all while they were still hot. Next up on the grills was the Rajasthani Murgh Ke Sole. The smoked chicken tikka had been marinated with yoghurt, chilli and gram flour and glazed in the tandoor. 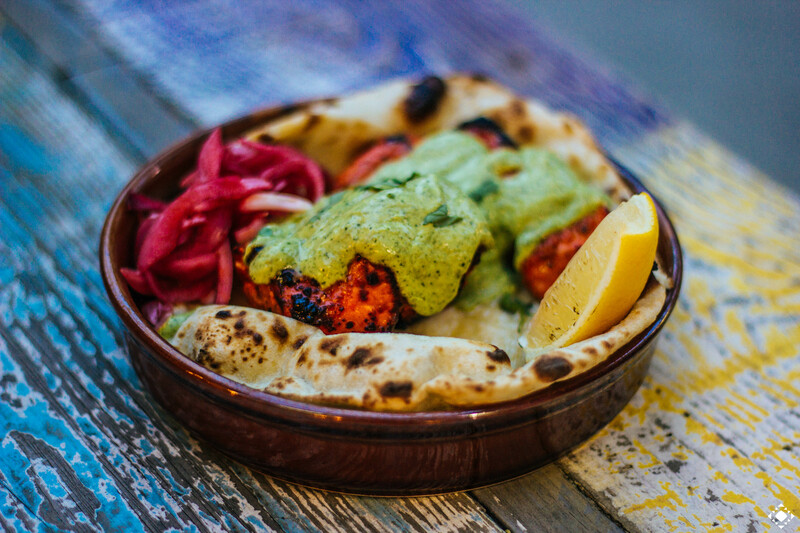 There were no faults with this dish which was served on mini tandoori naan with mint chutney and pickled red onion. The chicken had kept its moisture and the flavours were what you’d expect from smoked chicken tikka. We couldn’t resist ordering Kareem’s Lamb Burra Kebab & Aloo Chokha. 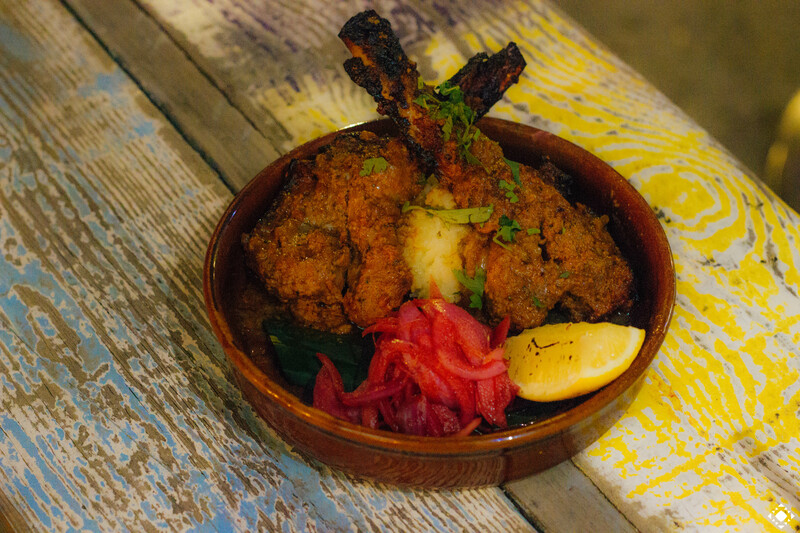 Lamb Burra is basically lamb cutlets which the chef had marinated in mustard oil, malt vinegar, red chilli and crushed spices. The chops were tender though I did feel that they had too much ‘masala’ on them. The tempered mashed potatoes were a lovely addition to the dish – who doesn’t love potatoes?! By this point in the evening the sun had come down (as did the quality of our pictures) but that didn’t stop us from enjoying the curries. The highlight in this part of the evening was the Lamb Pepper Fry (which I enjoyed for breakfast the next morning – don’t judge me). This South Indian curry was cooked with crushed black pepper which gave it a stronger flavour than the other dishes of the evening. The lamb was soft and enjoyed with the Laccha Paratha (a multi-layered flatbread). We also ordered the Butter Chicken which in contrast to the Lamb Pepper Fry was a much milder curry. It was a good dish but compared to everything else we had during the evening, not one that stood out. We also ordered the Masala Cheese Naan which we enjoyed on its own. To round off an epic meal, Zohra ordered a cup of Nani’s Masala Chai. The milky tea had hints of a mix of ginger, cardamom, clove, cinnamon and nutmeg and if you prefer a strong cuppa, this is one for you. Overall, this was an epic meal and we’re grateful for the invite from Chai Naasto. The restaurant has a huge menu that is suitable for meat-eaters, vegans and vegetarians alike. The service was great and the restaurant has both indoor and outdoor seating. The indoor space is relatively small and later in the evening it can get quite busy/noisy so the outdoor seating is somewhat of a haven. The restaurant was booked up on a Wednesday evening and a lot of walk-ins had to be turned away so if you’re looking to dine here be sure to book in advance. We ordered a heck of a lot of food which explains the total bill below. We’re not ones to waste food so we took all of our leftovers home. 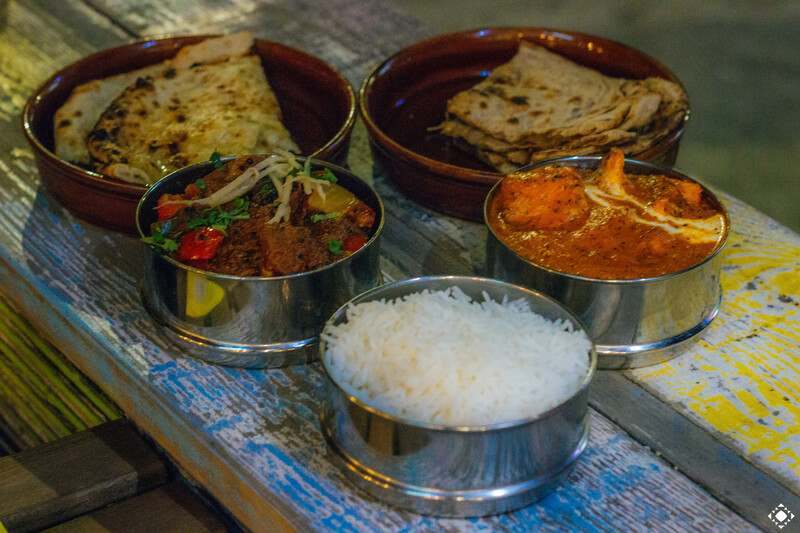 If you were dining at Chai Naasto, for two people we’d recommend 2-3 chaats, 2-3 items from the ‘Kebab Gully’ and a curry. With drinks, you’re more likely to spend £20-£25 per person which is very reasonable and good value for money. 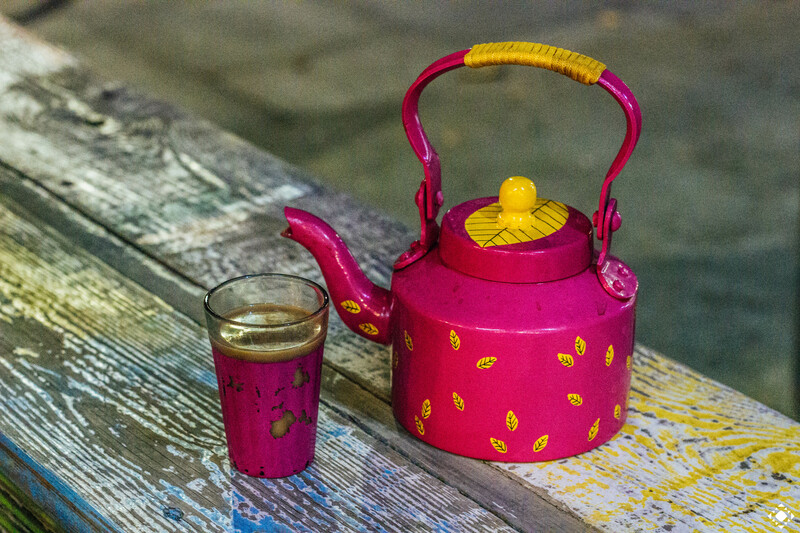 Chai Naasto is perfect for group dining and we can’t wait to return!